I've had another long break from blogging and I do have an explanation, I promise I will explain it all soon. Now to something a bit more exciting.. A couple of weeks ago I got to host a dinner party for my fave boys (wasn't really meant to be a lads dinner but what can you do!) with a little help from La Belle Assiette! 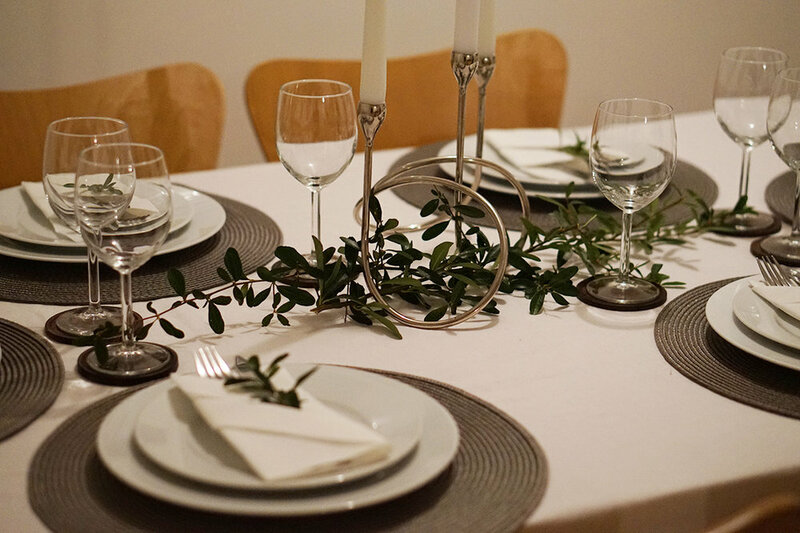 La Belle Assiette was founded on a very simple principle; "to make entertaining at home truly enjoyable". They offered to send me a chef so that I could enjoy the hosting part, without having to cook or clean - I mean.. how amazing is that? Rossana, a lovely woman from Italy, came to my house in the early evening. I showed her around my house and she got to cooking pretty immediately! We decided on a menu prior to her arrival so I knew what to expect-ish. I set my dining room table with a little help from my garden! We have a massive bush with leafy greens so I cut a bunch off and it made for really nice decor, don't you think? I folded the napkins (thanks youtube) into little pockets and popped the cutlery inside. For starter we had a lovely citrus salmon salad with spinach. It was simple yet very fresh and I've never had citrus fruit with salmon before?! So delicious. Rossanna was cooking away in the kitchen whilst we ate..
For main we had an amazing pasta dish with shrimp and tomato sauce - a dish I have to somehow try and recreate! And for dessert: Panna cotta with berries! We had such an amazing dinner and I truly recommend La Belle Assiette as a company. The entire experience was seamless and the very best part was walking into my kitchen after our meal and it was spotless! It's usually a massive mess whenever I've hosted a dinner party, haha. It's safe to say I would not hesitate having a private chef in my house again! This post is in collaboration with La Belle Assiette.